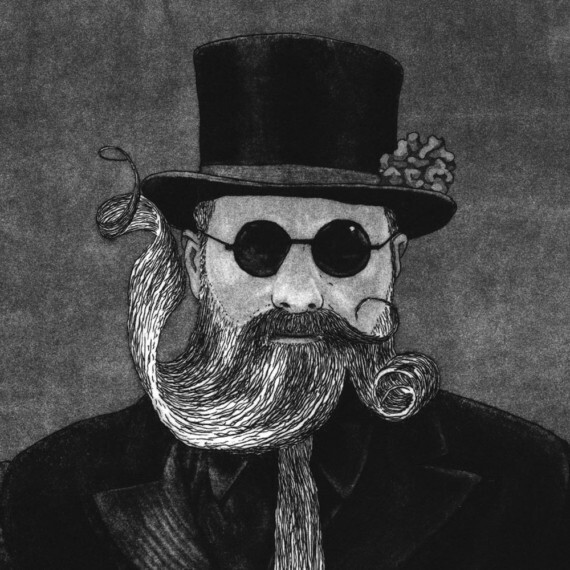 Nick Morley is a London-based artist who has a particular talent with linocuts and etchings. As well as exhibiting widely around the world, he has recently entered the world of book design, working with several publishers to create eye-catching and beautiful books. He was kind enough to agree to be interviewed. CAUSTIC COVER CRITIC: What's your background as an artist--how did you end up where you are today? NICK MORLEY: I studied Fine Art at university in Sheffield (in the North of England) and was making paintings, drawings and little performance pieces. After graduating I lived in Vancouver, Canada for a year scooping ice-cream and making bad art. Then I moved to London and started working as a gallery technician in some prestigious contemporary art galleries and got kind of swept up by the whole thing and wanted to be a famous artist. I couldn't afford a studio of my own so I started making prints, going to various printmaking studios where I could work in a concentrated way for short periods of time in between working. Eventually I joined East London Printmakers, and I've been making etchings, linocuts and screenprints for about ten years now. 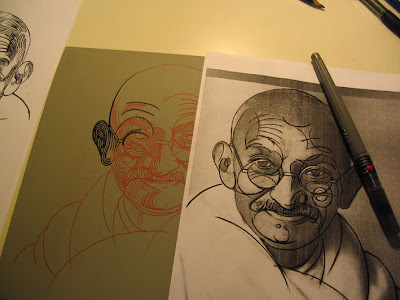 All my work is very much based in drawing and printmaking definitely lends itself brilliantly to working this way. 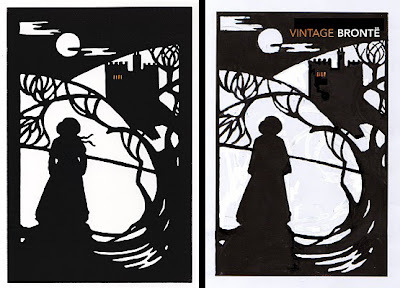 A proposed cover for the Vintage Classics Jane Eyre: on the left is the final linocut print, and on the right a draft rough. CAUSTIC COVER CRITIC: How did you first come to do book design work? Do you see it becoming a bigger part of your work in the future? 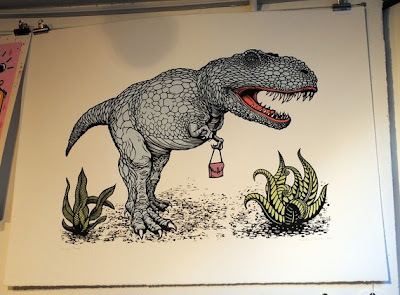 NICK MORLEY: I started to realise that the way I worked was quite suited to illustration. A lot of my personal work was portraiture and I'd made these etchings of wrestlers and bearded men. I was selling them at a Christmas fair and this woman bought a few. It turned out she worked for Penguin Books so I got her card and kept in contact. 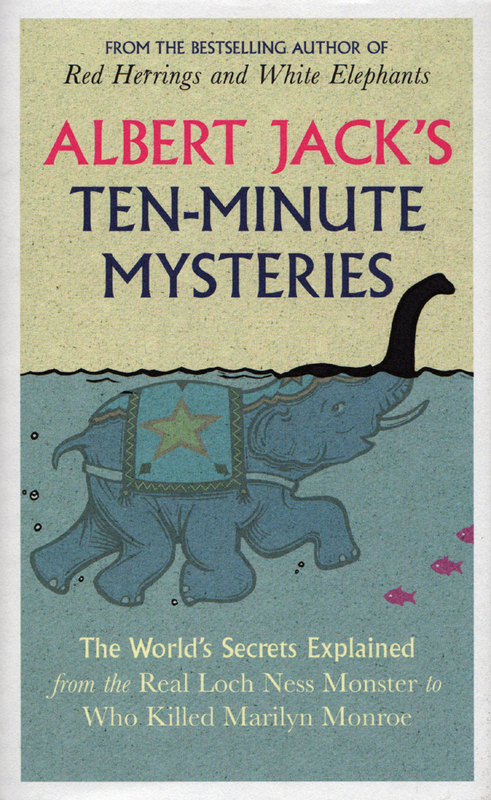 A year or so later she commissioned me for a book cover for Albert Jack's Ten-Minute Mysteries. 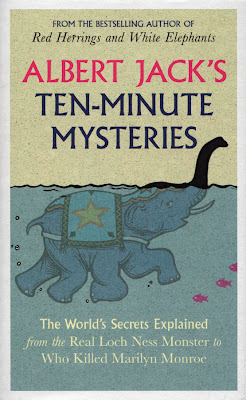 I had to do an illustration of an elephant swimming with its trunk out of the water to look like the Loch Ness Monster. The first illustration I did was rejected and I had to start over. Luckily they liked the second image and it was used on the book cover. I've done four published book covers now and I'd definitely like to do more. It's such a buzz seeing your work in the bookshops. I've been very lucky that I've already done work for Penguin, Faber and Faber and The Folio Society. My illustration for Folio was a portrait of Gandhi for his autobiography. 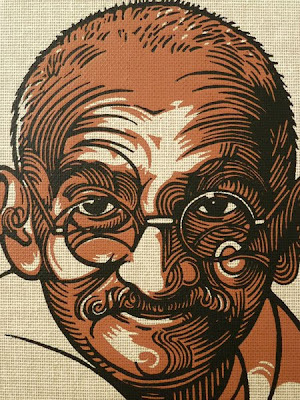 It was block printed onto a canvas cover which was great because it closely related to the way I made the image as a linocut. CAUSTIC COVER CRITIC: Are linocuts still your favourite medium in which to work? 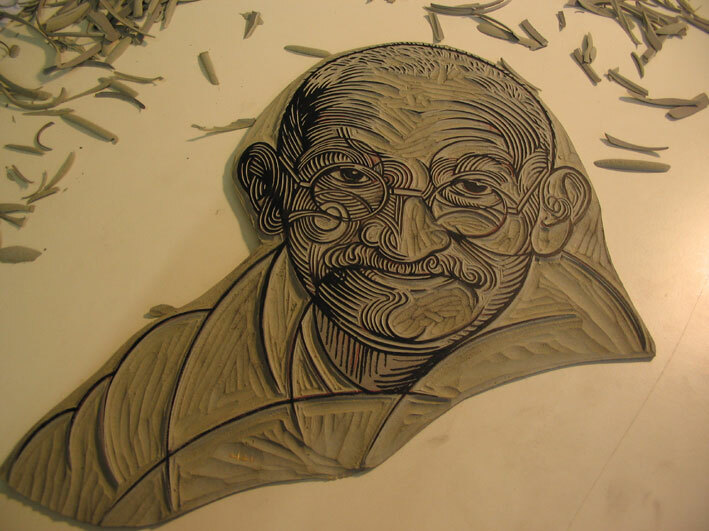 NICK MORLEY: I do love linocut. I think it is much underestimated as a technique. You can achieve very fine detail and subtle textures. There is always a trace of the artist's hand too, which is so rare in a lot of computer-generated work. I've kind of created a brand called Linocutboy and I try to promote the medium as much as I can. I teach linocut workshops and have a blog where I show my favourite finds by other artists and have step-by-step explanations of my own work and how I develop it. I also make etchings and screenprints and I draw a lot with a brush-pen and crayons. My drawings are very free and fast as an antidote to the rather slower processes of printmaking. CAUSTIC COVER CRITIC: Linocut artwork seems to be making a comeback in book design, and Lynd Ward is even being included in the Library of America collections. What do you think are its advantages in illustration? NICK MORLEY: There is a link with history that is very strong. The first illustrations were woodcuts, which is basically the same technique. I think that when you make a multi-layered print by hand you gain an understanding of how a printed image is put together, how colours can be laid over one another to create new colours and how everything fits together. You learn to simplify things and I think this is key to book cover design, it's about making an arresting image that the eye can read quickly. The boldness of the line also makes for a graphic quality which works well with text. 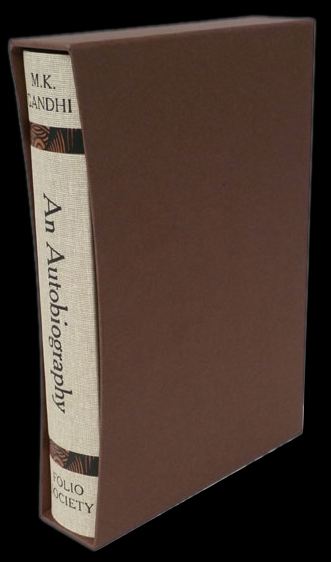 CAUSTIC COVER CRITIC: If you could design, inside and out, without budget limitations, any book from the history of literature, what would it be? 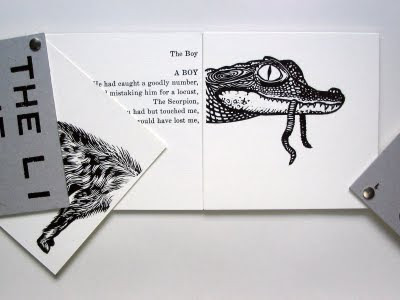 NICK MORLEY: Well, I've already made a little book which I designed inside and out based on Aesop's Fables. It's called The Lion and The Ox and The Boar and The Bear. 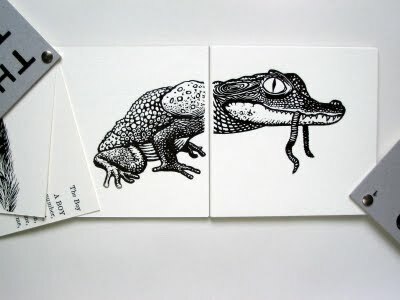 It has illustrations of the front and back ends of animals which you can fit together in different combinations depending on how you open the book. The text can also be read in a number of combinations, creating nonsense stories. I'm really interested in taking this further and I've been thinking about pop-up books and books that are structurally playful. I read a lot of children's books and I'd love to have a go at Charlie and the Chocolate Factory by Roald Dahl. I think the inventiveness of Willy Wonka's creations would work well with a format where things moved and spun and grew and changed colour! I'd use thermodynamic ink, scratch and sniff... Mmm, you've got my juices flowing now. CAUSTIC COVER CRITIC: Is there any neglected book you'd love to draw to people's attention as something they should seek out? NICK MORLEY: Not really one book, but a concept. 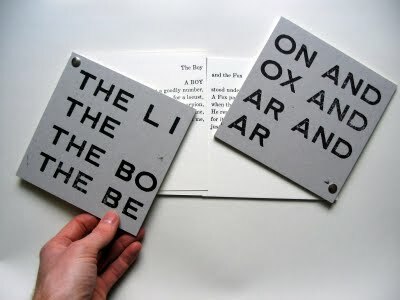 My friend Victoria Browne runs a great project for artist's books called Kaleid Editions. She published my Aesop's Fables book. She's worked with a lot of great artists who are really pushing the boundaries of what a book can be. Some of the ideas may take a while to catch on in the mainstream publishing industry but I think it's important to do something experimental every now and then to keep the imagination ticking over. CAUSTIC COVER CRITIC: Thank you, Mr Morley! These are great. 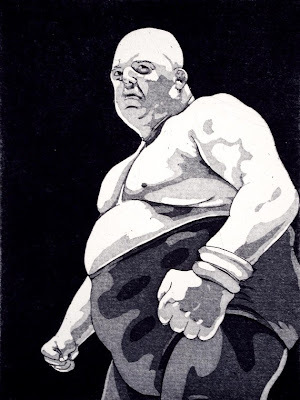 I particularly liked the wrestler. What an expression on his face! 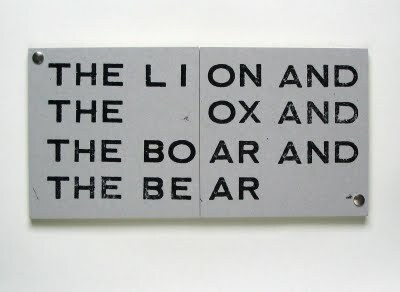 I loved 'The Lion and The Ox and The Boar and The Bear"! Hope to see it get published. Thanks for this, very interesting as always. 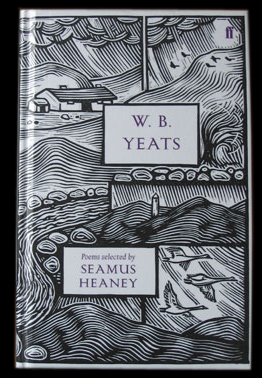 I'd seen those beautiful Faber selection covers, but I hadn't seen anything else by the artist. 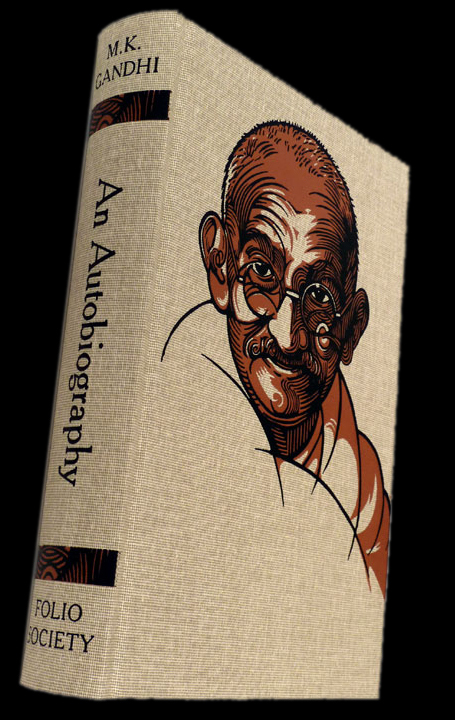 I really like the Ghandi cover, especially — it's always fascinating the see the different steps in the creative process, and reassuring that people still use hand-made cuts and prints to create the artwork for covers. It makes the art is so much more alive! Spam comments will be ruthlessly suppressed with extreme prejudice.